Recap - Sox have a winning streak! It may be modest, but the Red Sox have an honest-to-goodness winning streak going! Dustin Pedroia had 3 hits, Grady Sizemore and Jackie Bradley Jr. each had 2 as the Red Sox came from behind twice for a 6-3 win over the Atlanta Braves at Turner Field. For Boston it was the team's 2nd straight win after suffering through a 10-game losing streak. 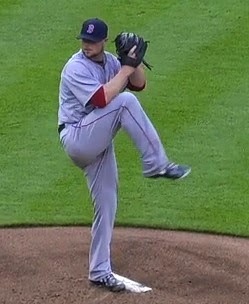 Jon Lester (pictured) wasn't particularly sharp, but he pitched well enough to earn the win and improve to 5-6. He gave up 3 Atlanta runs on 8 hits and 3 walks over 6 innings. He struck out 7. Boston and Atlanta traded runs in the 1st inning. Pedroia drove in a run with a sacrifice fly; Jayson Heyward answered with his 4th home run of the season to even things up. The Braves took a 2-1 lead in the bottom of the 3rd until David Ross singled home a run in the top of the 4th; Atlanta went back on top with a single run in the bottom of the 5th. The Red Sox took the lead for good with 4 runs in the top of the 7th inning. David Ortiz contributed an RBI single, Sizemore drove in another with a ground out, and Jackie Bradley Jr. sent 2 more in with a single. The Boston bullpen contributed 3 scoreless innings. Craig Breslow, Junichi Tazawa and Andrew Miller each went 2/3 of an inning; Koji Uehara pitched a clean 9th inning for his 11th save of the year.